Ok, I'm not really wearing a blanket here, but this scarf is so big, it could be used as one! It's quite convenient in the event that we ever want to go for an impromptu picnic in the park!! I've been a little behind on outfit posts since my Nana's passing, but even though this photo isn't current and was taken a few weeks ago, I wanted to show you guys how well this huge scarf covered my bump! Not that I'm not proud of the belly, but as I've mentioned before, sometimes it's nice to look (somewhat) like I did pre-pregnancy. Below: newest version of my scarf, same brand, similar look. I am loving that sweatshirt! That scarf looks so warm and cozy. It is so funny how you don't look pregnant from the front, but totally from the side...I think I looked pregnant from every angle!! So sorry about nana's passing. But you look lovely. Getting close now huh? 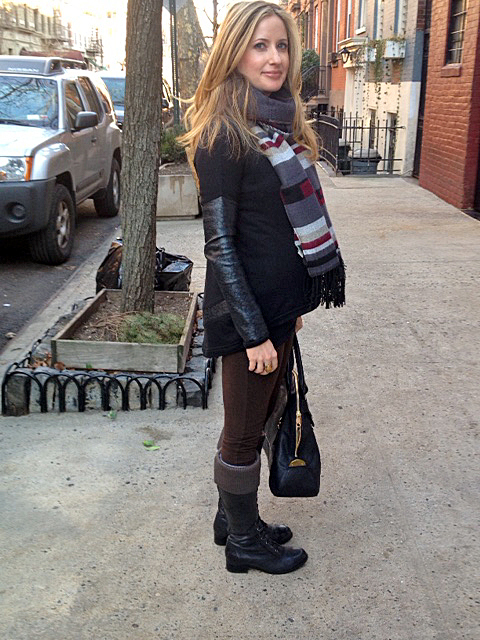 A big scarf is very complimentary to a cute pregnant belly. I love our outfit, but wear your tummy with pride! I love big warm scarfs.